Relocation of crocodiles from Narmada dykes for tourism safety "mindless, contentious"
In a letter to the Union environment, forests and climate change minister, senior officials of the ministry under him and their Gujarat counterparts, including chief minister Vijay Rupani, top Vadodara-based environmentalist Rohit Prajapati has demanded that the government must immediately stop translocation of the crocodiles from the lakes near Sardar Sarovar Dam, as the translocation of crocodile is “not a viable/appropriate solution”, and it is short-sighted with long term adverse impacts. In absence of unknown number of crocodiles in the present Dyke 3 & 4, it is not possible to claim a crocodile free water body. Moreover, there is also the possibility of crocodiles entering the dykes from adjoining water bodies that are at the distance of 18 - 20 km from the Narmada Dam and main river course. 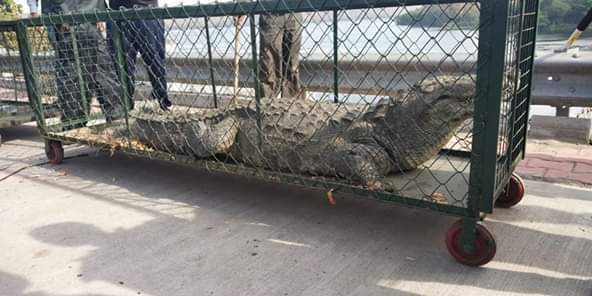 More significantly, the importance of this species is illustrated by the multiple legal and policy efforts which have been developed by the Government of India to protect the crocodile's population. This species is categorized as nationally ‘Vulnerable’ subsequent to an assessment following IUCN criteria for threatened species (Molur & Walker 1998) and has the highest legal protection in India as it is listed in Schedule I of the Indian Wildlife (Protection) Act 1972. Any activity which is against the survival of the highly protected species without having been approved by the State Wildlife Board and National Wildlife Board and the Government of India is patently illegal. There are established Rules, Regulations, and Policies to be followed before attempting to relocate scheduled species. The ‘Indian Crocodile Conservation Project’ was launched as early as the late 1960’s. Subsequently, the crocodile has been included in Appendix - I of Convention of International Trade in Endangered Species (CITES) and brought under Schedule - I of ‘The Wild Life (Protection) Act 1972’, meaning that any activity which is against the survival of the highly protected species without having been approved by the State Wildlife Board / National Wildlife Board and the Government of India is patently illegal. Basu, D. 2006. Report on mugger Crocodylus palustris conflict vis-à-vis initiation of water sports in dyke-lakes of Sardar Sarover Project, District Rajpipal, Gujarat. Crocodile Project, Uttar Pradesh Forest Department, Lucknow,10 pp (Unpublished Report). Da Silva, A. and Lenin, J. (2010). Mugger Crocodile Crocodylus palustris. Pp. 94-98 in Crocodiles. Status Survey and Conservation Action Plan. Third Edition, ed. by S.C. Manolis and C. Stevenson. Crocodile Specialist Group: Darwin. Vyas, R. (2010). The Muggers (Crocodylus palustris) of Vishwamitri River: Past and Present. Herpetology & Environmental Research Project (HERP), Vadodara, Gujarat State, March 2010: 32pp+ Fig.5+Table 11+ i-xxi.